We turn bearish on the Swedish krona as the spectre of protectionism and the "trade war risk premia" should continue weighing on the global trade-levered krona in coming months. The SEK has all but lost its relative current account surplus advantage vs the EUR, making the currency increasingly vulnerable to global risk factors. Importantly, the recent SEK weakness is unlikely to create a significant inflation overshoot, thus not warranting a Riksbank response. We revise our EUR/SEK forecast materially higher, expecting EUR/SEK to hit 10.30 in coming months and stay above 10.00 throughout 2018. While concerns about the Swedish housing market appear to be diminishing, a new bogeyman has appeared in the form of the Trump administration’s aggressive tariffs on steel and aluminium. The spectre of protectionism and trade wars could well remain until at least the November US mid-term elections. And White House economic adviser Gary Cohn’s resignation suggests to us that things will get worse before they get any better. That means that a degree of a "trade war risk premia" is warranted for SEK, given Sweden’s economy is highly exposed to global trade. 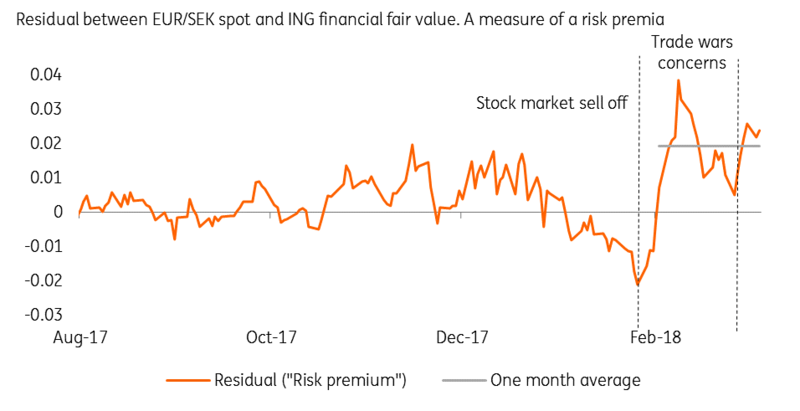 Since the stock market sell-off in early February and the recent bout of concerns about protectionism, EUR/SEK has been trading with a 2% average risk premium (Figure 1). Given the ongoing uncertainty about the US trade policy (and its implications for the global trade relations), we look for EUR/SEK to incorporate a persistent "trade war risk premium" in coming months. We see a meaningful probability that such a risk premium widens even further in response to concrete actions from the US administration. Indeed, given that Sweden is one of the most open economies in the G10 FX space, the notion of trade wars is a clear negative for the low liquidity, high beta and global growth-levered SEK. The SEK has all but lost the relative current account surplus advantage vs the EUR. 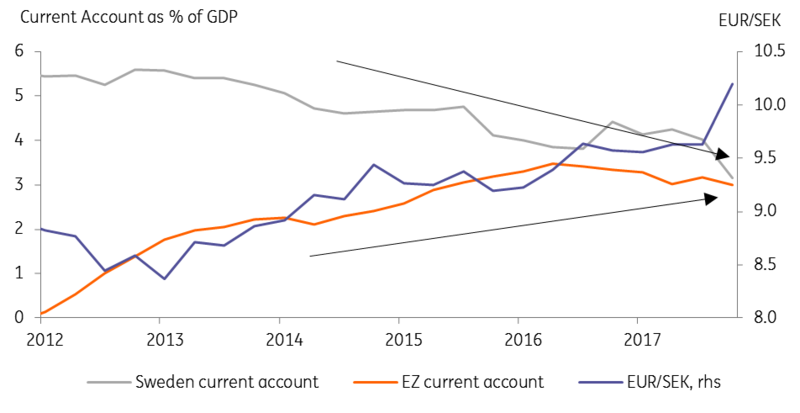 The deteriorating Swedish current account surplus (from 4% of GDP early last year to a projected 2.5% by end 2018) contrasts with the Eurozone current account dynamics which remain stable at around 3% of GDP (Figure 2). 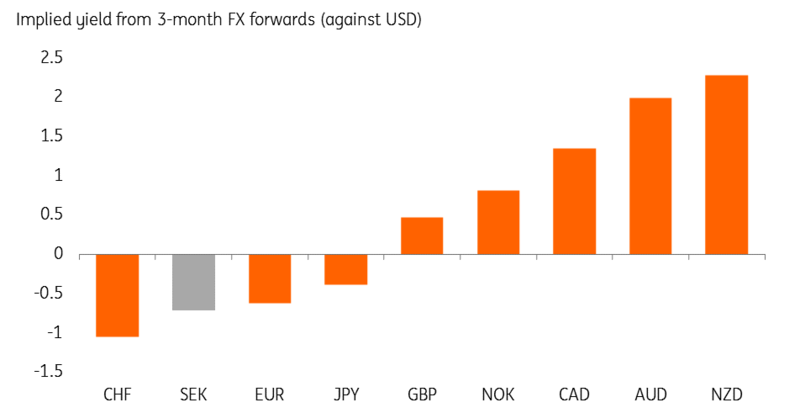 As the relative current account positions converge, the krona’s cushion vs the euro fades away, making the currency more vulnerable to the direct effect of global risk sentiment or the relative monetary policy position. From the current account surplus point of view, SEK is now swimming naked. And the tide may be about to come in. We don’t think the Riksbank will be in a rush to tighten monetary policy prematurely in response to currency weakness. 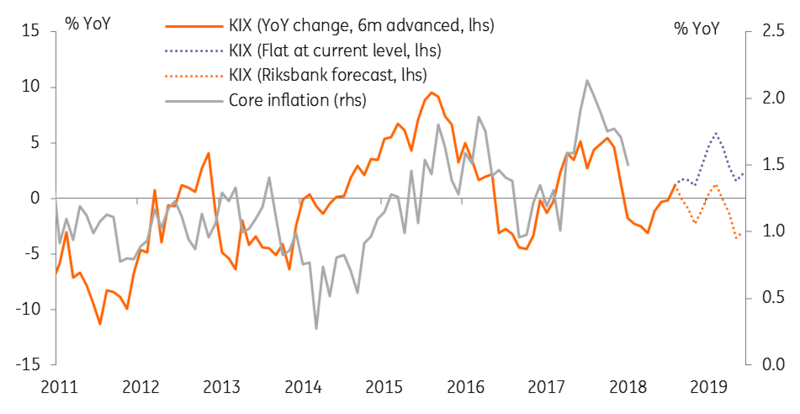 In fact, our analysis suggests that SEK weakness is consistent with the Riksbank achieving its inflation target this year. Given the Riksbank’s current forecast has inflation at 1.7% on average for 2018 (under the assumption that KIX appreciates gradually), there is scope for SEK depreciation to push prices up without triggering a monetary response. A weaker currency would in effect offset the recent softness in Swedish core inflation and put the Riksbank more at ease (Figure 3). That supports the current Riksbank 'wait and see' stance. Even if we see a couple of months of inflation above 2%, that is unlikely to overly worry the Riksbank, given inflation previously spent six years below target. In testimony to Parliament yesterday Governor Stefan Ingves continued to emphasise the risks posed by a rapid appreciation, while sounding intensely relaxed about SEK’s recent depreciation. Moreover, it is important to note that it is the trade-weighted SEK (the KIX index) that is relevant for the Riksbank (rather than EUR/SEK per se). With the current and expected strength in EUR/USD, krona weakness against the euro is in part offset by a higher EUR/USD (which pushes SEK higher against the USD block FX) in terms of the trade-weighted SEK. Although the market pricing of the Riksbank path has declined in recent weeks, the 20bps currently priced in by year-end is still higher than our base case of a 10bp hike in December. This suggests limited room for Riksbank re-pricing led SEK strength and is consistent with our view that potential catalysts for material SEK strength are rather scarce. Due to the Riksbank’s ultra-loose policy, SEK suffers from deeply negative implied yields. Aside from the Swiss franc (CHF), SEK is the cheapest currency to short (Figure 4) but unlike CHF, it is not a safe haven. Although its negative implied yield is only marginally lower than the euro’s, unlike the euro the low-liquidity krona is not a reserve currency. All this makes SEK vulnerable to bouts of risk aversion, particularly in the context of the deteriorating current account dynamics. We thus revise EUR/SEK forecast materially higher, recognising the change in SEK dynamics and a lack of meaningful catalysts for SEK strength. Although SEK remains meaningfully undervalued vs the EUR (around 12% based on our medium-term BEER model) the catalysts for a sharp turnaround are simply not in place. We raise our forecast linearly, looking for EUR/SEK to hit 10.30 and trade above 10.00 for the remainder of 2018 (vs 9.50 previously, see figure 5). We note that although the expected start of the Riksbank tightening cycle in Q4 2018 should be SEK supportive, we believe the usual year-end downward pressure on STIBOR (due to the resolution fund payments at year-end) will limit the SEK upside at that time. Given the spectre of protectionism, we see upside risks to our EUR/SEK forecasts should the global trade wars intensify.